Decorative bike racks or what I like to call Art Racks are all over the place. It’s a safe bet that most people have seen these, but I’m hoping I’m presenting a couple that are new to the Art Rack game or others that are more out of the public eye and not over-exposed. At the very least I hope my pithy commentary adds a deeper dimension to these dedicated pieces of art serving double duty as bike racks. How appetizing is a half eaten donut? 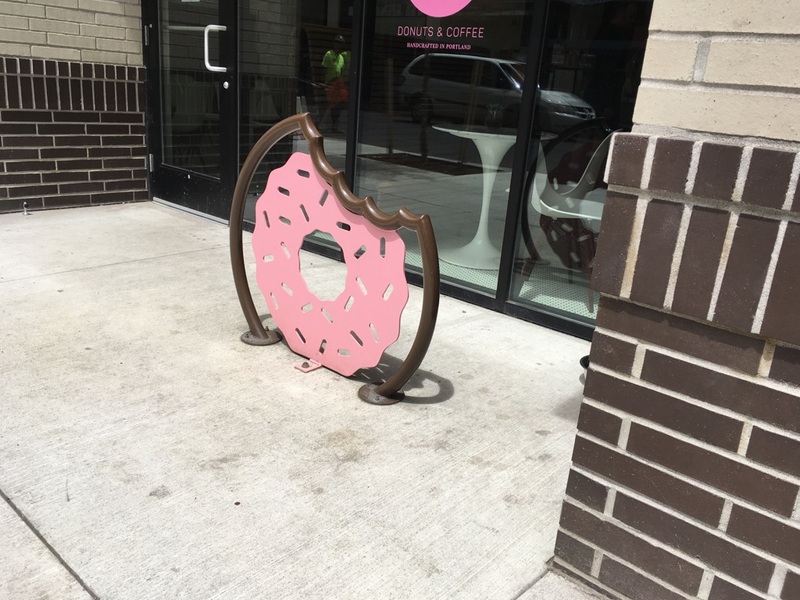 Is it more appetizing than a half eaten donut bike rack? It reminds me of the best way to eat donuts–two bites. The first, a test bite, then down goes the rest. There seems to be an overly sweet intensity to considering a giant pink parking place, donut-eating-wise – appealing to the eye, appalling to the stomach. A condo building on North Williams was designed with every detail imaginable taken under consideration. 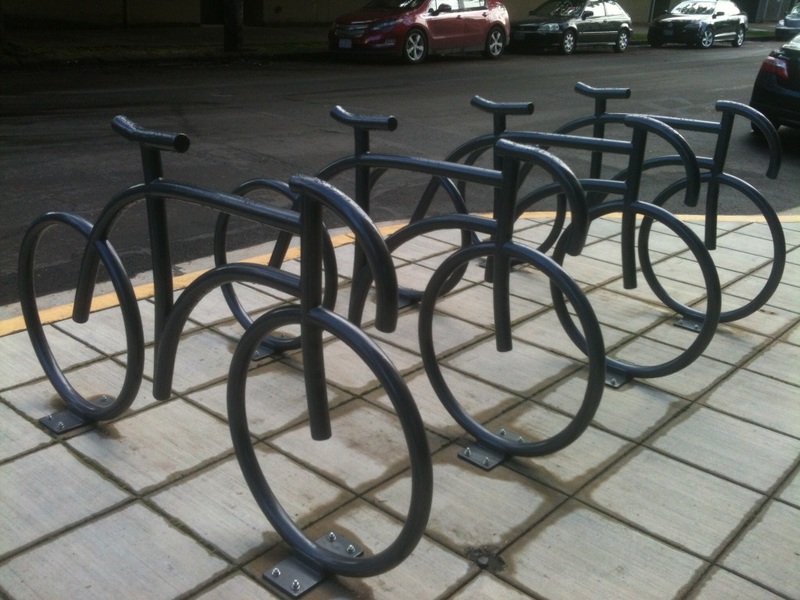 Whether it was an after thought or a decision debated in multiple meetings, (we’ll probably never know) these bicycle-looking bike racks were included in the project. Streamlined, functional, elegant. That covers the categories essential to condo bike racks. The inescapable feeling that the racks are either cliché or ironic is best left on the boardroom table. No further meetings are scheduled. 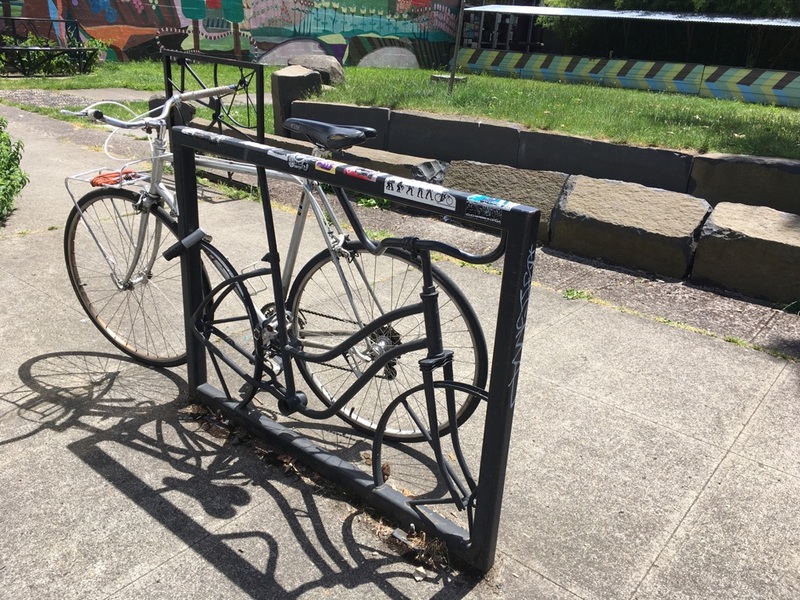 While on N Albina Ave, I spotted this ingenious rack that includes bike parts. In the photo it is difficult to see where the rack starts and the real bike ends. This camouflage might mean the bike rack will soon be stolen. 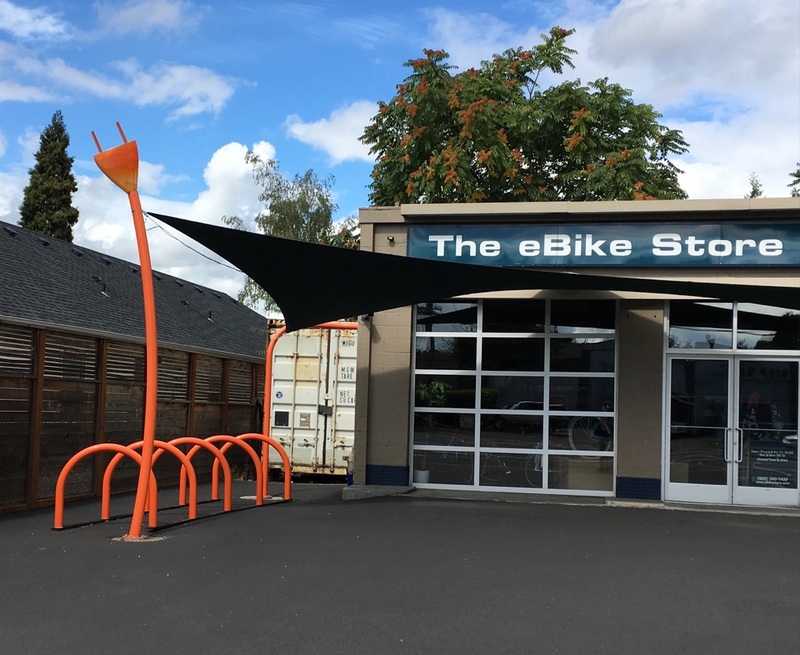 The last consideration has to be about how a bike mars the sign’s look, but at least that’s only on a temporary basis while the bicycle is locked up. Unless your bike and lock somehow damages that shiny painted ironwork finish. 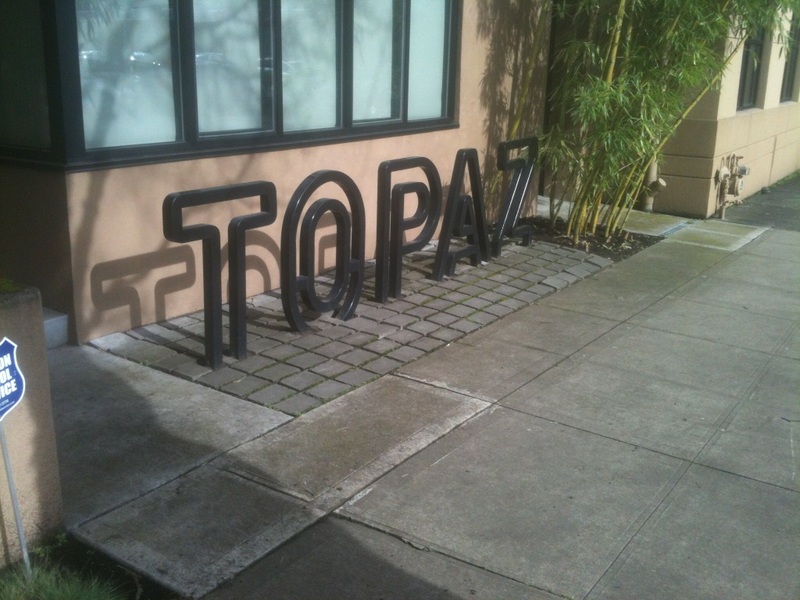 It may be worth the risk if you are desperate to enter TOPAZ. 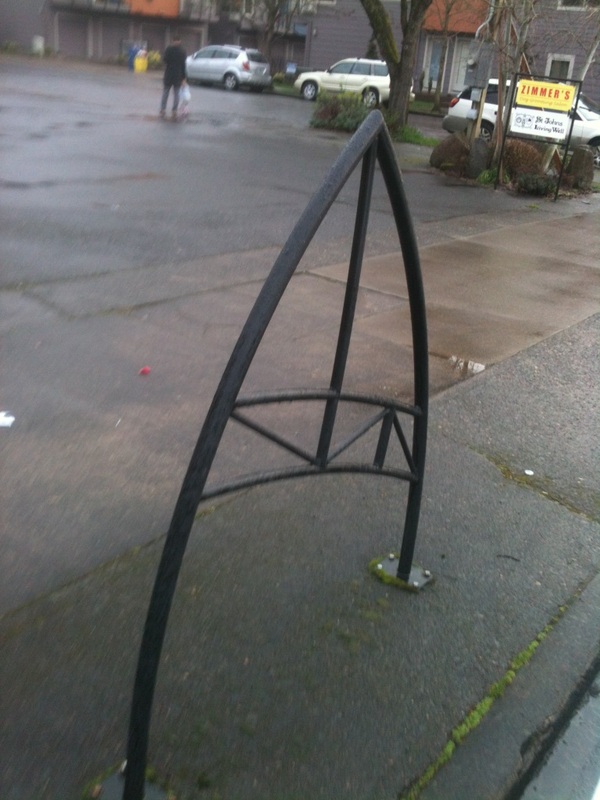 In St Johns this rack takes on the look of a Star Trek insignia. I do feel a “Beam me up Scotty” joke welling up. It’s a bit wonky but it looks well bolted into the concrete and sturdy enough to do the job when you’re in town. 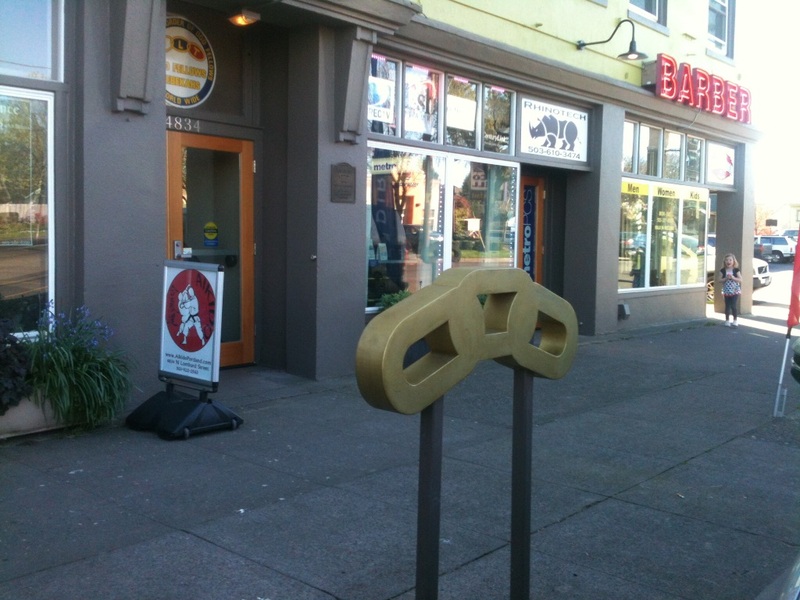 I’m not knocking these racks outside of Sparky’s Pizza on MLK and Lombard, when I describe them as buried safety pins. That’s the first thing that comes to mind. Also it’s important not to get their various locations mixed up when ordering carry out. The design seems so different. 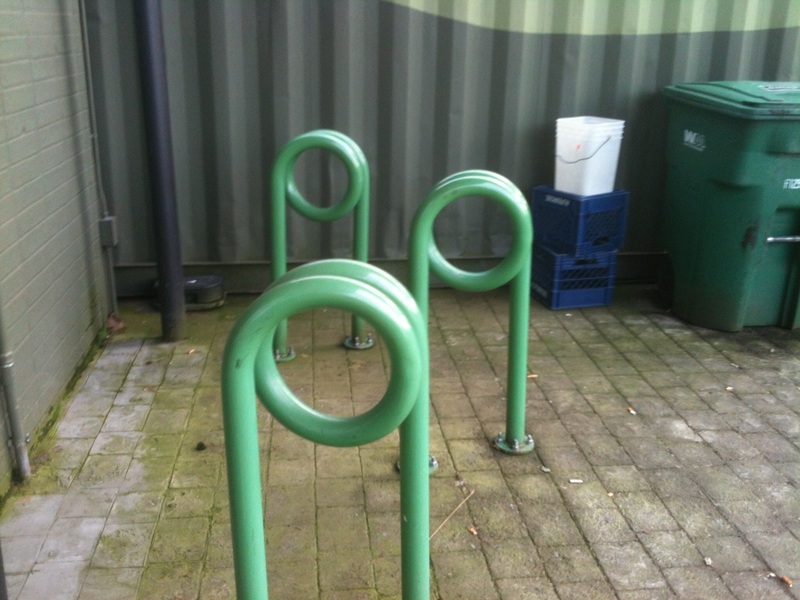 I may even be wrong to assume they are bike racks. They could be related to pizza making process, although I’ve never seen anything related to food preparation going on under the bricks or in the metal tubes in front of a business. I like the look of these and their green color. I can’t attest to the functionality because I’ve never picked up a pizza carry out order while riding a bike. This rack outside the Odd Fellows on Lombard St. seems more dedicated to topping the rack off with a symbolic design than offering anything more than a slim pole to lock a bike to but that’s an Odd Fellow convention. Would you want it any other way? 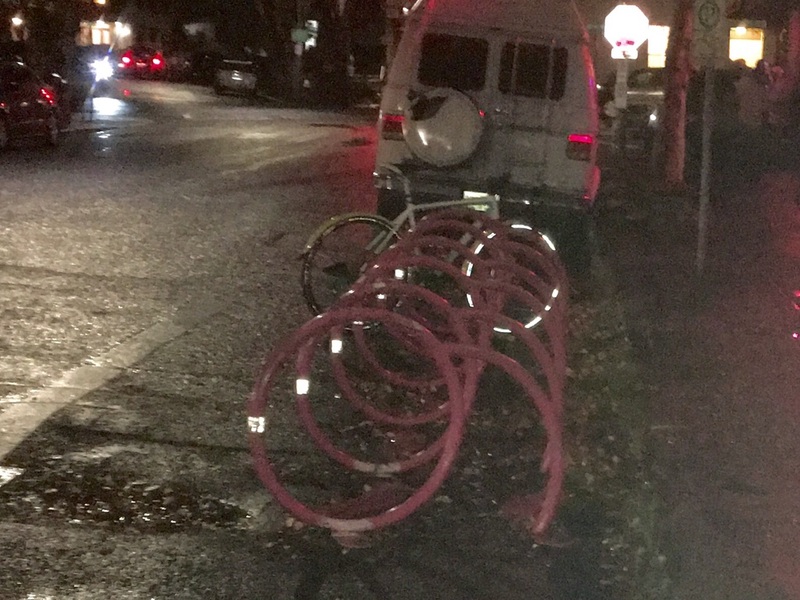 Nothing spectacular here, but these racks, seen one night in the Clinton St. District, are more eye-catching than your run of the mill bike racks and possibly more functional. With that, this blog post rolls on into the night. May all your biking adventures include time with an art rack. Tune in next week for an Orbit Buddy Holly tribute. Brilliant! Sounding more like a native Portlander every day…. Well, thank you. How long do you have to live in Portland to qualify for that?